We are often asking each other "how are you?" and I for one must say...I have never had a friend reply with "I’m relaxed." It just doesn’t happen. On the other hand, "I’m so tired," or "I’m so stressed out" gets said often. In the hustle and bustle of everyday life, our daily routine can often be a blur — a blur we allow ourselves to accept as normal, not noticing how depleting this pace is, and that we need to make time for ourselves. So unless we have been meditating all day everyday on a beautiful mountain top for the past five years, it’s safe to assume that we can all use and benefit from a little more relaxing. Here are my top five, go-to yoga poses for relaxation. A beneficial restorative pose, this posture helps release the lower back, lower blood pressure, and provide relief from insomnia and anxiety. It also opens the hips and chest, increases blood circulation in the abdominal region, and calms the mind. You can do this pose with or without props, but should you want a bolster under your lower back, a folded blanket beneath your head, or something to cover your eyes — please do not hesitate to do so. Make adjustments if you're not comfortable so you can soak up all the goodness of this posture. Does anyone not like this pose? It’s one of the easiest to do anywhere and it's loaded with wonderful mind and body benefits. Legs Up the Wall Pose is actually a mild inversion, and if you place a folded blanket under your hips in this pose, the slight elevation helps drain lymphatic and other fluids from the lower part of your body into your abdomen. These are the kinds of fluids that can cause tired knees, swollen ankles, and congested pelvic organs. Lying in this position can help alleviate headaches, soothe menstrual cramps, increase energy and relieve lower back pain. Child's Pose is perfect for when you've had a long, exhausting day and you just want to get comfy and curl up in a ball. This resting position can be held for as short as 30 seconds up to several minutes — depending on how long it takes you to relax into the posture and get fully comfortable. Even though it's considered a resting pose, Child's pose will also give a gentle stretch to your hips, ankles, thighs, and shoulders. It can relieve back and neck pain when the head and torso are supported, calm the brain, and assist in the reduction of stress and fatigue. Close your eyes, breathe, and let all that stress go. Forward bends come loaded with benefits, whether you do it standing or sitting. This pose will stimulate the liver and kidneys, improve digestion, help relieve menopause symptoms, and stretch the hips, hamstrings, and calves. It can also help ease headaches, relieve insomnia, and reduce stress, anxiety and fatigue by calming the brain. I would recommend practicing Forward Bend especially to those who work and sit behind a desk all day because it works wonders on the lower back as well. 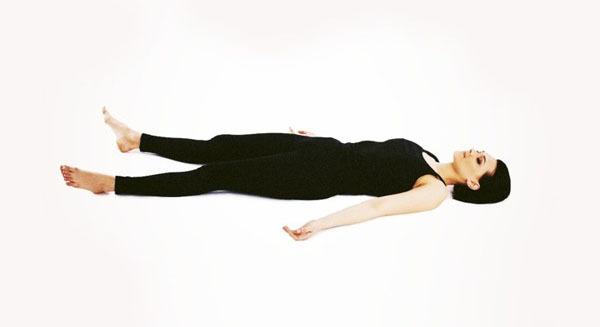 It may seem physically easy, but Corpse Pose or Savasana is actually one of the most challenging postures to do. For a lot of people, it can be a real struggle to lie there, relax, and just be. Generally practiced at the end of yoga class, Corpse Pose is known for its ability to calm the mind, relax the body, lower blood pressure, and reduce headaches, insomnia, and fatigue. Doesn’t that sound delightful? And with (almost) zero physical exertion required too! Once you start to unwind in this pose, your body temperature may cool down a little, so I suggest keeping a sweater or a blanket within reach. It’s crucial to have moments where we put ourselves and our needs first. This doesn’t make you a selfish person; on the contrary, it will help you become even more considerate and caring because compassion should always start with the self. If we put good things into our bodies, good things will come from them. Make time to be kind to yourself so you can face the world head on and pay that kindness forward.